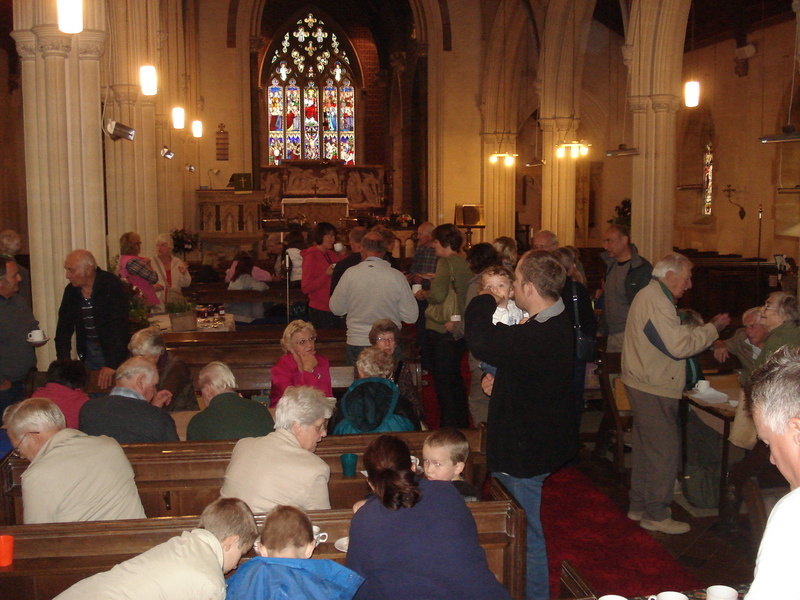 This morning we held a Macmillan Coffee Morning in our local church. 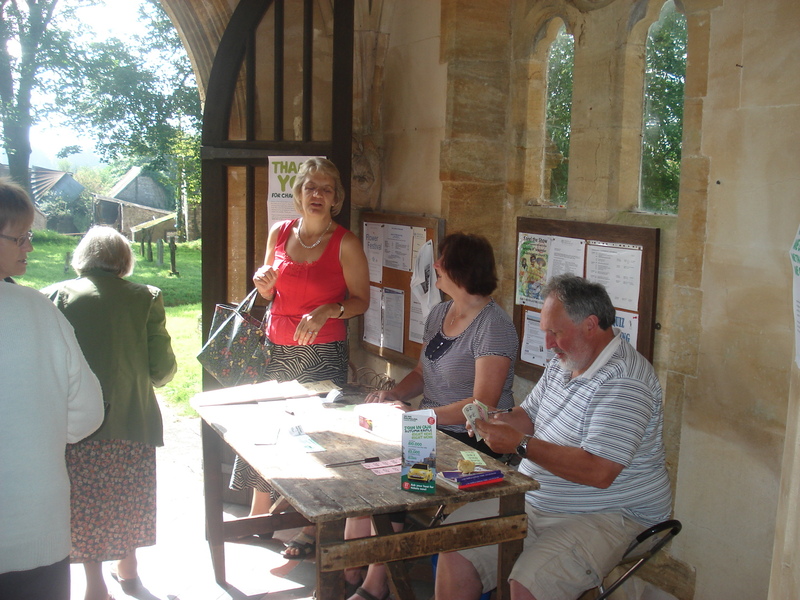 We had a cake stall, a raffle and served tea and coffee and biscuits. 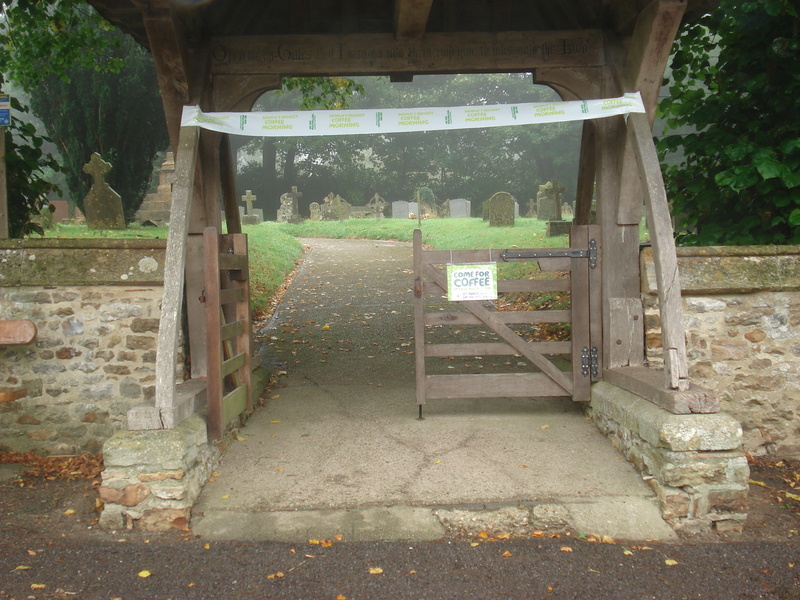 We had a banner and a sign outside the church to advertise it. Two of our friends ran the raffle. We had Macmillan raffle tickets and our own raffle today, so we did a BOGOF. For every Macmillan raffle ticket purchased you got a strip for today’s raffle free. The raffle raised £82. Two other friends ran the cake stall. We had Rocky Road, Flapjacks, Victoria Sponge Sandwich, Tea Loaf, Fairy Cakes, Rock Buns, Fairings biscuits, as well as jams and marmalade, eggs and apples to sell. This stall made £58.25. 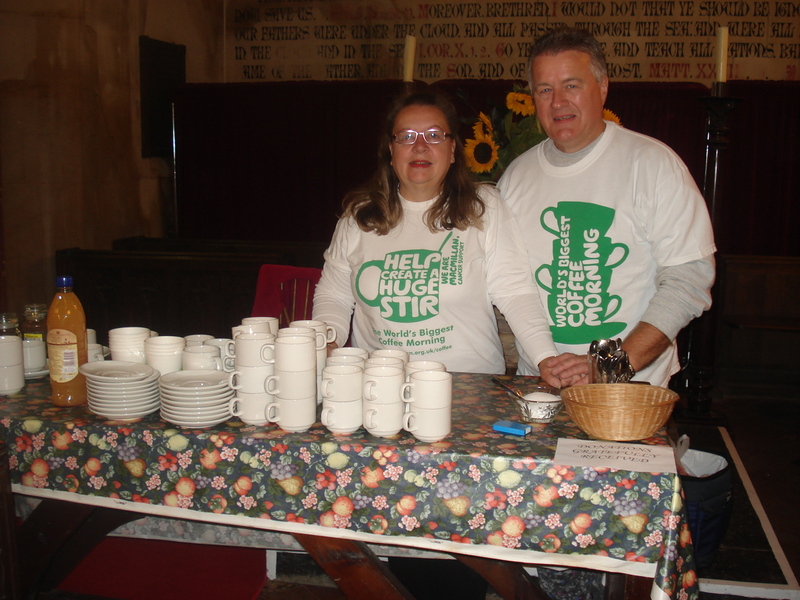 Neil and I made the tea and coffee in the vestry end of the church. We didn’t charge but asked for donations. People are often very generous this way and we took £83.70 in donations. As you can see Neil and I are wearing our rather unglamorous Macmillan Tee shirts. Macmillan supply quite a lot of material for support and we had bunting, balloons, posters and table cloths all in Macmillan green. We had a reasonably good turnout, although perhaps not as many people as last year. The total amount we took was £223.95, so all in all a good effort. 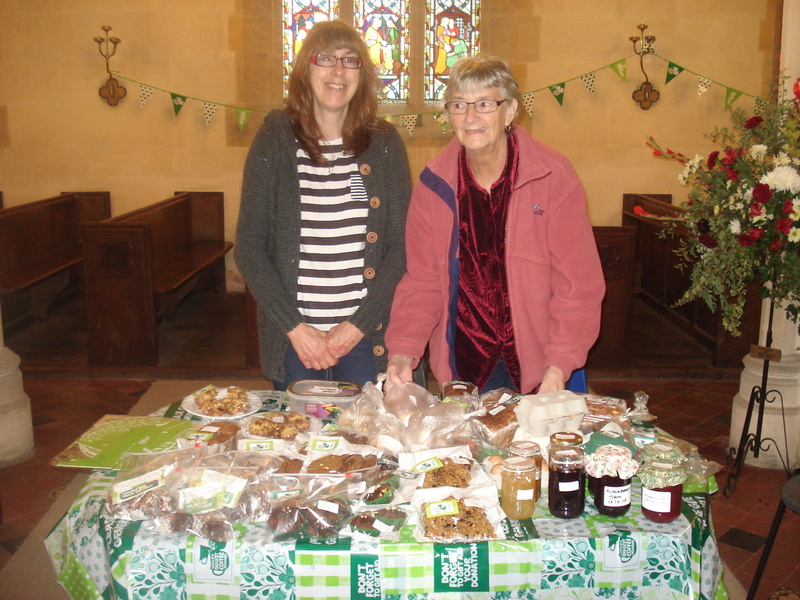 Yesterday we hosted a fundraising Macmillan coffee morning in Buckland St Mary church. 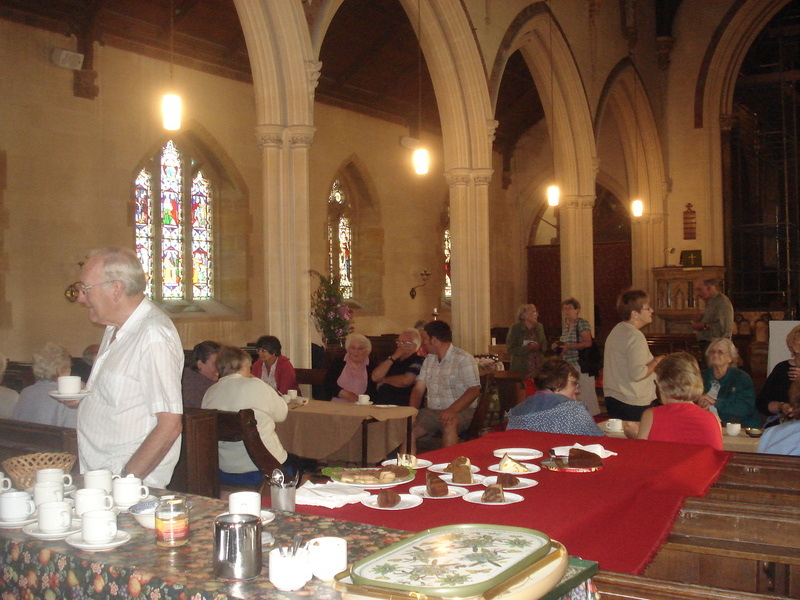 Every second Saturday of the month a coffee morning is held in the church. Each month different people organise it in aid of different charities. The actual date set by Macmillan for the “World’s biggest coffee morning” is Friday 28th Sept, but as here it has to be a Saturday, we did ours early. I got my friends to help out too. We had 2 people on the raffle in the porch, catching people as they came in. Two more friends manned the cake and jam stall (I had been baking all day Friday and other friends donated cakes they had made too). Neil and I were on tea and coffee making and he did most of the washing up, helped by another friend. It still felt like hard work, all for an hour and a half coffee morning, but still, only once a year and we made £259 altogether. 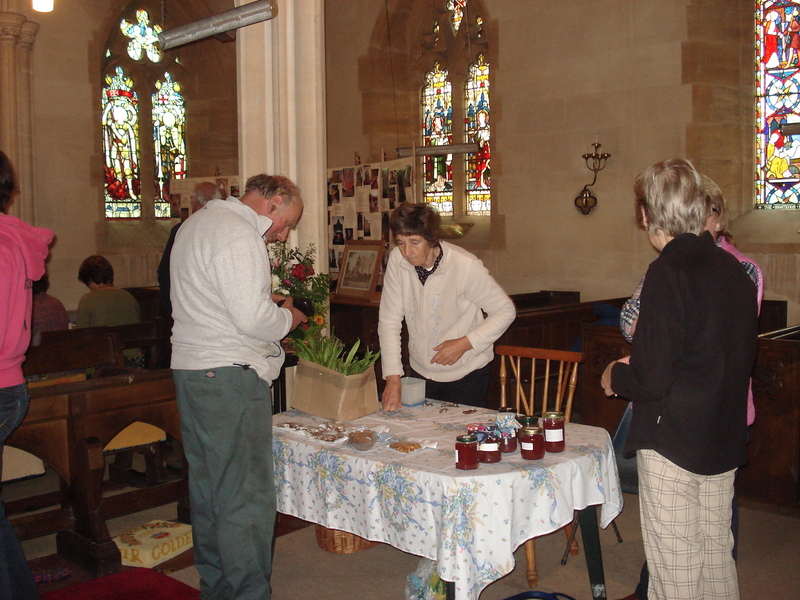 We took £103.20 in donations for coffee, and a further £103 for the raffle, and £52.80 in cakes and jam. So this week we will be sending £259 to Macmillan Cancer support charity. We were pleased with the amount raised and grateful to all the helpers and all attendees. 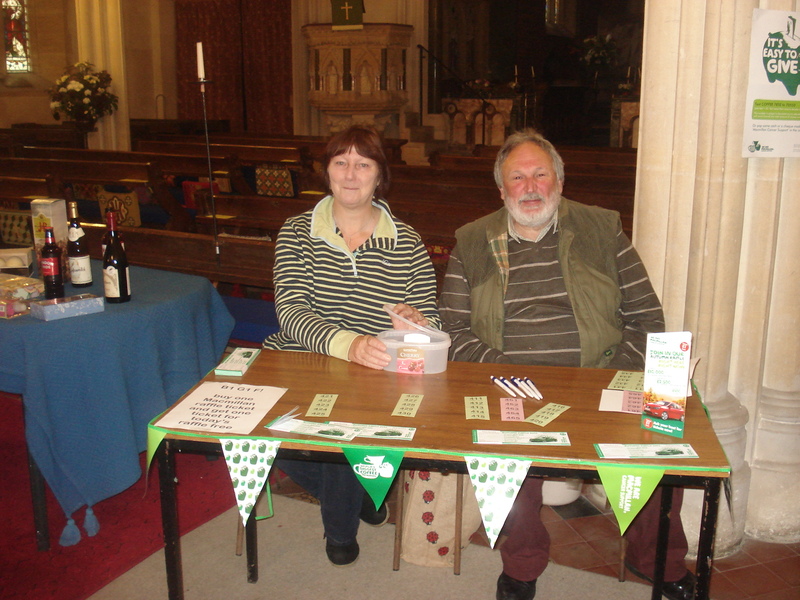 This morning Neil and I hosted a Macmillan Coffee morning in Buckland St Mary Church. It was like a military operation getting everything ready, making lists of things to take and baking like mad yesterday afternoon, to make cakes and biscuits for sharing and to sell. 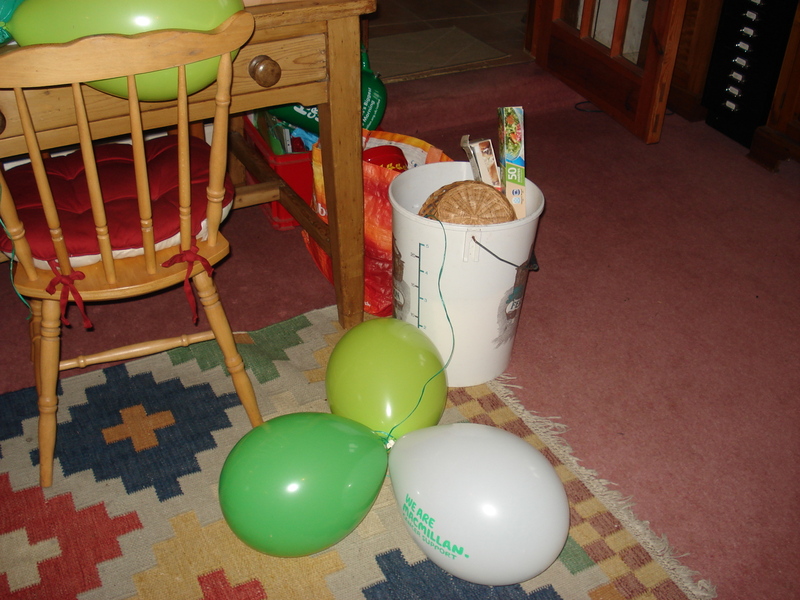 We got everything ready last night, even blew up the balloons so we would make a quick start this morning. 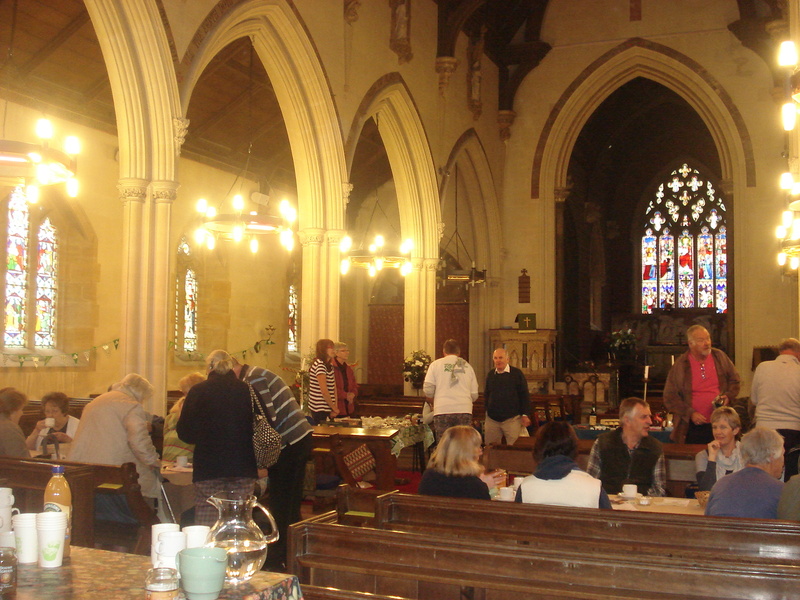 We’ve hosted Macmillan Coffee mornings before, when we lived in Langley, but doing it from home is quite different from doing it in the church, because we had to take literally everything with us. I’d roped friends in to make cakes aswell and other friends to work on the cake stall and to sell raffle tickets. We’d advertised it in the local parish magazine and also in the local paper. Over 100 people turned up. Neil and I made tea and coffee all morning and there was cake to eat too. We asked for donations rather than selling it and people were very generous. Overall with the cake stall, the raffle and the donations we took £370.00, which we think is excellent. 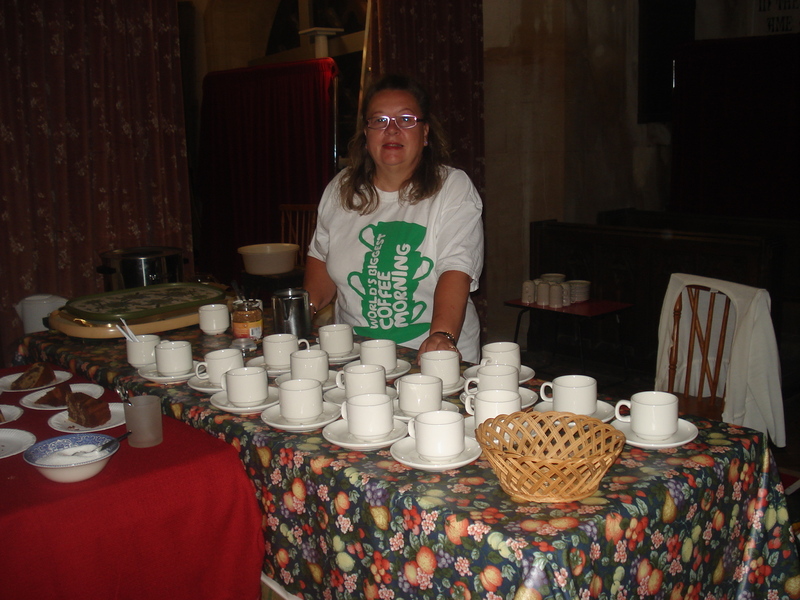 I must admit it felt like hard work, especially as there are no facilities for washing up there , so we had to bring home all the cups, saucers and plates and wash them up at home, to take back this evening. What fun!! Anyway in 19 months I think you can say we have well and truly integrated into our local community to hold a coffee morning, get that many people turn up and make so much money.